The video converter also offers additional features of clipping, watermarking, cropping and adjusting effects to assist you to enhance movie effects and create more featured movies. Incredibly easy to use for both novices and pros, Video to MOV AVI MPEG brings you different digital life experience. This video converter can convert almost any kind of videos including WMV, MP4, MOV, AVI, FLV, 3GP, MPG, VOB, MPEG, ASF, MOD, RM and HD video to MOV, AVI, MPEG format for many PMPs. As a versatile video converter, this Video to MOV AVI MPEG Converter can extract audio from video to AAC, AC3, MP3, M4A, MP2, WAV. 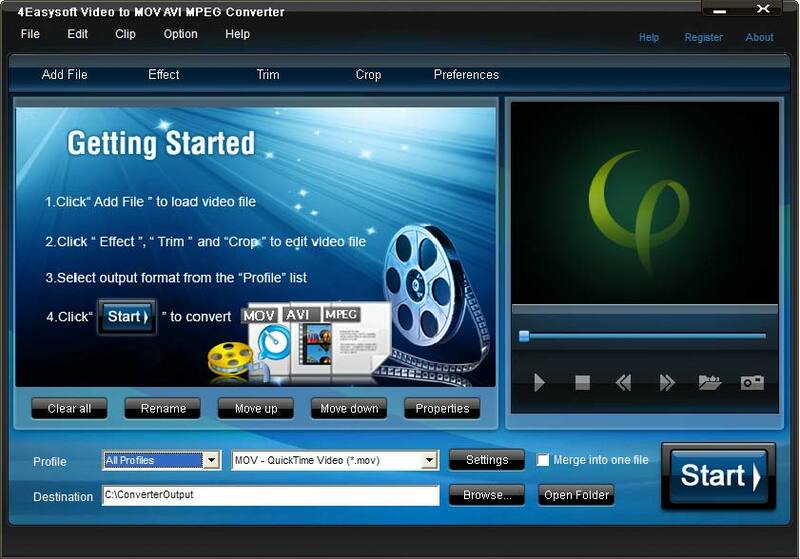 4Easysoft Video to MOV AVI MPEG Converter allows you to set the video Brightness, Contrast, Saturation. Checking Deinterlacing helps you to convert interlaced video to the progressive video, this function can optimize the video effect. Join several interesting clips into one then enjoy it successively. Crop frame size to remove your unwanted area using this video converter like the smart scissors. Allow you to add image or text watermark and set its position, transparence, even text font-style, color, etc. With the straightforward interface outside and powerful codec inside, 4Easysoft Video to MOV AVI MPEG Converter offers you the highest conversion speed with good quality and brings you more convenience and enjoyment. Adding the watermark function to insert text or image. Output multiple formats from source with only one click.